Cut off the bottom of the asparagus. Pour 1-2 tablespoons of olive oil over the asparagus in a large bowl and toss it together. Put the asparagus on a broiling pan and then salt and pepper it to taste. Place the pan about 4″ below the broiler. Cook for 10 minutes turning them occasionally. 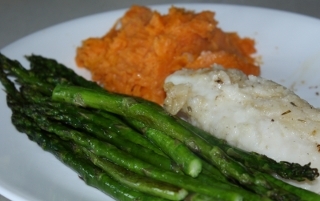 The asparagus should be light golden brown on tips and tender.